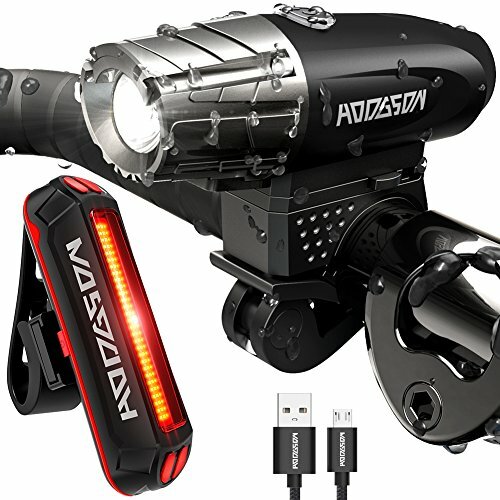 HODGSON LED light set mounts quickly onto bicycle handlebars and seat posts. Great for cycling at night or in places where visibility and safety are a concern. PRETTY DURABLE BICYCLE LIGHTS- Our products have solved all these concerns: Eliminating insecure installation and troublesome mounting procedure by simplifying and optimizing silicone mount straps' structure. Removing sudden not charged phenomenon by equipped with high quality charging panel and USB charger. SUPER BRIGHT BIKE LIGHT- Comes with a 400 lumens IPX4 waterproof headlight and tail light making your bicycle stand out with unmatched 360º visibility to ensure your safer in any low light conditions, even in rainy night. ADJUSTABLE MULITI-MODES- Our Headlight has 4 modes: High mode (2hr runtime), Mid mode (4hr runtime), Low mode (6hr runtime) and Flash mode (5hr runtime). Our taillight has 6 modes: Low (6hrs run time), Mid (2hrs 15 mins run time), High (1hr 30 mins run time), 50% Flashing (5hrs run time), 100% Flashing (3hrs run time) and Strobe (2hrs 30 mins run time). EASY INSTALLATION: The silicone mount straps are designed tightly fit around many size seat posts, handlebars and seat risers to keep lights secure and firm. They can be easily loosen and fasten, and no tools are required. WARRANTY SERVICE- We provide a 24-month guarantee and great customer service. Please charge the lights at regular intervals(usually 1 month), or it will damage the batteries and shorten service time. If you have any questions about this product by HODGSON, contact us by completing and submitting the form below. If you are looking for a specif part number, please include it with your message.